This Post has already been read 2151 times. Samsung Electronics, has announced the arrival of the sleek Galaxy Pocket Smartphone that not only brings premium mobility to your palm, but also promises comfort to your pocket in terms of affordability. Powered by a strong processor, this mobile device delivers a rich and smart mobile experience, offering real value of money! The Android based Smartphone allows you to multi task between several applications without having to close any of them, which enhances your experience and productivity. Improved text input provides speedier, more accurate typing for Web searches or quick messaging. Integrated high-speed WiFi and HSDPA 3.6 connectivity ensure lag-free Web browsing and fast downloading for multimedia content. Samsung’s upgraded TouchWiz interface offers smoother menu navigation through easy-to-access widgets, providing easy shortcuts to frequently-used functions. The Social Hub app helps you mange social networking apps & integrates all SNS, email and calemder accounts. Samsung Electronics strives to provide users with unparalleled Smartphone experience. 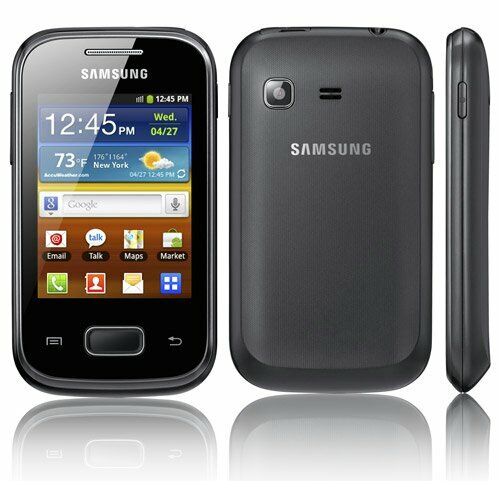 Recently launched, the Galaxy S III Smartphone is an intelligent device designed for humans & inspired by nature. It goes beyond smart and fulfills your needs by thinking as you think and acting as you act. The launch of Galaxy Pocket at a more affordable price reflects Samsung’s commitment to create the smart communication needs of diverse consumer segments.